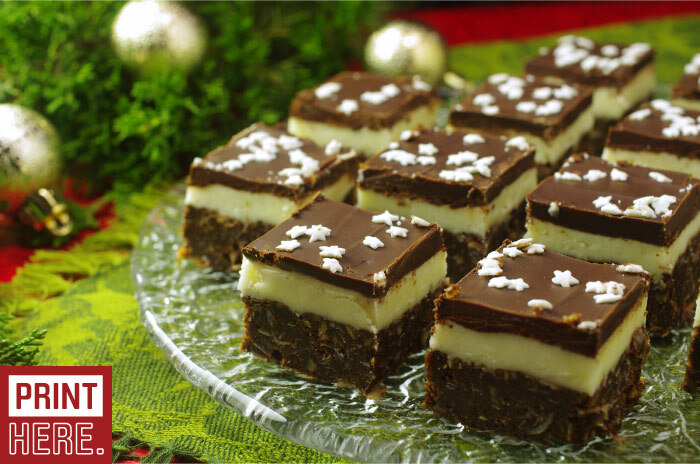 We’ve taken the famous Nanaimo bars from British Columbia, Canada and put a holiday spin on their flavor and presentation. We included peppermint extract in the buttercream layer – a genius move, (if we say so ourselves! 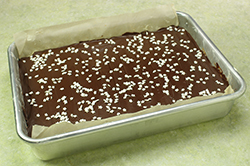 ), then sprinkled a few white stars on the dark chocolate topping for a festive effect. Additionally, we’ve shifted a few ingredients from the traditional list, and while traditionally a no-bake bar, we found it easier just to bake the crust layer. Our kitchen meanderings resulted in a decadent bite of cookie bar heaven. 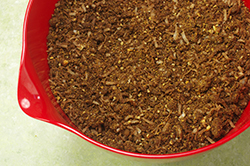 The crust is reminiscent of Almond Joy, the topping akin to a dark chocolate peppermint patty. Indulge and enjoy! 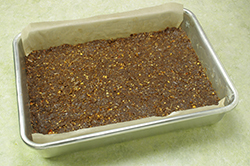 These bars are rich – cut in small squares. This recipe is made for sharing, but is easily halved. 1. Preheat the oven to 350°F. 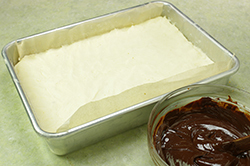 Grease or line a 9 x 13 baking pan with parchment paper. 2. Mix together all the crust ingredients, except the butter, until well combined. Pour the melted butter over the crumb mixture and toss well. Spread into the prepared pan, patting firmly into place with the bottom of a glass. Bake for 12-15 minutes or until the temperature in the center is 165°F. Remove from the oven, place the pan on a cooling rack and all to cool completely. The crust will initial appear wet and under-baked, but will crisp and firm as it cools. 3. In a medium bowl with a hand mixer, or the bowl of a stand mixer, beat together the butter, pudding mix, vanilla and peppermint extracts. 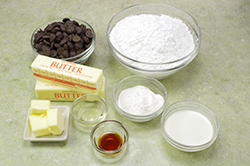 Gradually add the powdered sugar to the butter mixture a cup at a time adding a tablespoon of cream after each addition. The texture of the filling should be stiff, yet spreadable. If too stiff, add additional cream a teaspoon at a time. Spread the filling over the fully cooled crust. Chill until well-cooled and firm, at least an hour. 4. 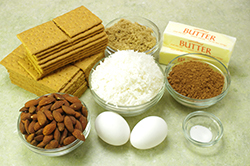 For the topping, melt the chocolate over a hot water bath or with short bursts in a microwave. Add the butter to the melting chocolate and stir well until combined. Pour over the filling and spread evenly. Add sprinkles if using. Chill for 15-20 minutes. Score the top chocolate layer while the chocolate is still setting up; this will assist in creating a clean edge later when completing the cutting step. 5. 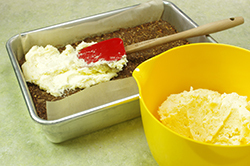 Remove the chilled cookies from the pan by lifting out using the parchment paper as a sling. Place the cookies on a cutting surface. Cut into 1-inch squares (or desired size) along the scored lines. Store in the refrigerator, or freeze, wrapped well, until ready to serve.